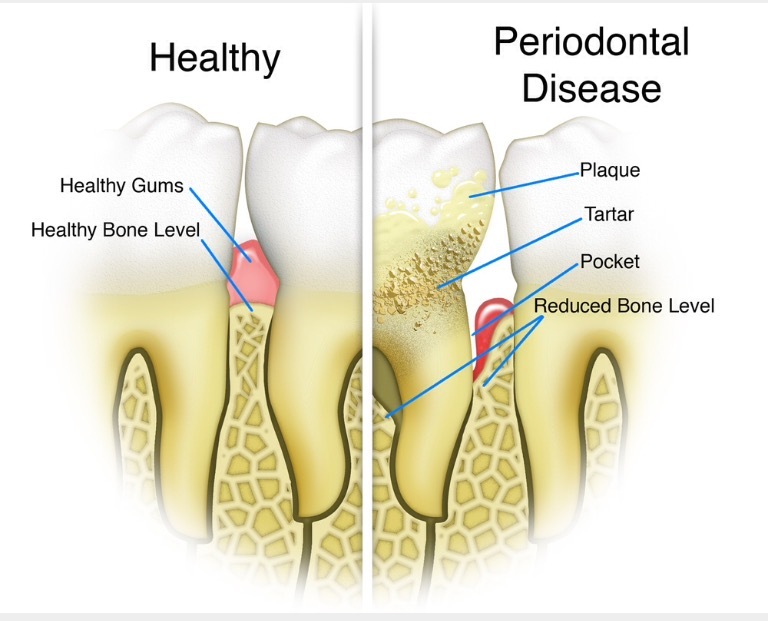 Are you experiencing gum pain or suffering from periodontal (gum) disease? Visit Village Perio & Implant Dentistry to get the best dental implants and periodontal treatment in the DFW area. There are many wonderful surgical and non-surgical treatment methods for periodontal disease. Dr. Moore works hand-in-hand with your primary dental provider to ensure your maintenance schedule is convenient and effective. Dr. Moore believes that quality of life is infinitely better if one has a full compliment of teeth. Most patients want to keep their natural teeth for their lifetime. But, if teeth are lost, implants are powerful additions in restoring function and comfort. Implants with special connections help denture wearers keep the denture in place and increase biting strength, and reduce future bone loss. When a tooth can not be saved we do the extraction in our office. Dr. Moore has over 25 years of experience extracting teeth. If sedation is desired or needed we offer those services too. We believe in making the patient as comfortable as possible. If the tooth is going to be replace with an implant, Dr. Moore will do socket preservation at the time of extraction. Periodontal plastic surgery. Gum surgery. Before Photo. Periodontal plastic surgery. Gum surgery. After Photo. These procedures are a predictable way to cover unsightly, sensitive, or exposed root surfaces and to prevent further gum recession. Esthetic Crown Lengthening and Gum Reshaping picture. Before picture. Esthetic Crown Lengthening and Gum Reshaping picture. After picture. Do you feel your teeth look too short and your smile is too gummy? If so, esthetic crown lengthening might be the solution for you. Both your genetics and health history may result in "short" crowns. 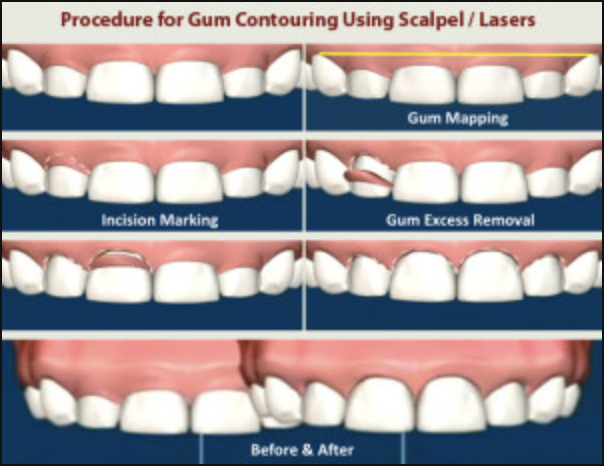 During this minimally invasive procedure, Dr. Moore removes excess gum tissue to sculpt a beautiful new smile. He will work with your dentist when crowns or veneers are planned. When an upper molar tooth has been missing for an extended period of time, often, the sinus drops down. This limits the amount of bone available to place dental implants. Dr. Moore performs 2 techniques to "lift" the sinus membrane and graft more bone in the area, so implants may be placed. If a person has lost all or most of his or her teeth, the Hybrid may be the course of action. The remaining teeth are extracted and room is made to place implants and secure a titanium bar and acrylic denture to the implants. This denture is only taken out by your dentist once a year to check the tissue and clean it. No cream or bonds or pads. If you have a receding gum line it may that your frenulum, the small band of tissue between your lip and gums, is pulling on the gums. A frenectomy is a surgical procedure that removes or loosens that band of tissue that connects the lip and bottom of the gums. © 2019 Copyright Village Periodontics & Implant Dentistry. | All Rights Reserved. Village Periodontics and Implant Dentistry is a family-owned practice located in Highland Village, Texas that currently serves the DFW and Southern Oklahoma area, operating under the ownership and medical professionalism of Dr. Drew Moore, DDS, MS.